We use a minimum of three high resolution (300 dpi .jpg or other) photo files and can include as many as you would like. Offspring photos also welcome. All paperwork must be received no later than December 31, 2019. Email materials to Gay Adams sunstonemorgans@comcast.net, fax to 1-(866) 761-0277, or send via postal mail to: 16818 S. Manor Dr.; Oregon City, OR 97045. Press releases on Northwest Morgan News, MHAO newsletter (Stable Sheet), MHAO website, MHAO Facebook Page & the MHAO Stallion Service Auction Facebook Page, in The Morgan Horse Magazine, on The Blast, etc. There is heavy emphasis on advertising the stallions included in our auction. The Stallion Auction will be promoted at the Oregon Morgan Classic (OMC) Horse Show & donated stallions will be highlighted. OMC is the largest Morgan Horse Show in the Northwest. NEW THIS YEAR! The name of all stallions with a bid will be put into a hat for a drawing. 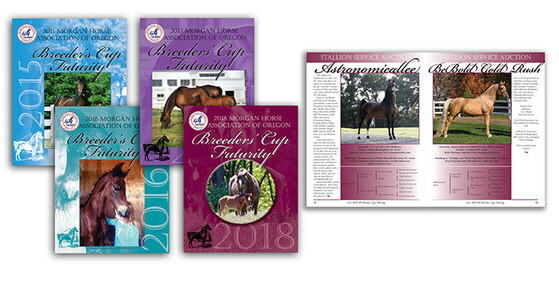 The winner will receive a free 2-page spread in the 2019 MHAO Breeders' Cup Futurity Booklet. Each stallion donated receives a full page color ad in the MHAO Breeders' Cup Futurity Booklet. This is a high quality magazine distributed up and down the West Coast & Grand Nationals. Bonus payments are made to breeders and stallion owners when a foal that is the result of a breeding sold through the MHAO Stallion Service Auction becomes a Futurity Sweepstakes Champion or Reserve Champion at the Oregon Morgan Classic Horse Show. Funds from the MHAO Stallion Service Auction are used to support the MHAO Breeders’ Cup Futurity which is the only known Futurity in the Western Region. Morgan Horse Association of Oregon Breeder’s Cup Futurity classes will be held at the Oregon Morgan Classic Horse Show held June 19-22, 2019 at the Oregon Horse Center in Eugene Oregon (2020 dates to be announced later). Minimum starting bid is $700, or an amount set by the stallion owner (higher or lower, but no lower than $500). Bidding was open from January 1st to March 9th, 2019.